Sheila Rosenblum has become a force in the horse racing world. The Manhattan mother of two and owner of Lady Sheila Stable owns over 20 racehorses, and is now a fixture at the Belmont Park Racetrack nearly every week, cheering on her growing list of champion racers. With some of her closest friends, Rosenblum oversees two all-female syndicates, including Lady Sheila Stable Two, which has eight partners, and Triumphant Trio, with three partners. She and racing world doyenne Vivien Malloy, a dear friend and Bergdorf Goodman heiress, own horses jointly. Rosenblum’s star horse, La Verdad, is a five-year-old mare who has made over $1.35 million to date. “She’s won all these awards for races from all the New York tracks: Belmont, Aqueduct, and Saratoga, and her three-year-old sister, Hot City Girl, just won a $350,000 race,” she says. “It’s very exciting.” At the time of this interview, La Verdad was among the favorites for the Breeder’s Cup in Lexington, KY, in late October, and a contender for either the Filly & Mare or TwinSpires sprints—a potential $1 million purse. “This year’s been pretty incredible. I recently had four major wins. You know, it’s rare for anyone to have such a great streak, especially someone who’s relatively new on the scene like me,” she said on a recent afternoon in the living room of her Park Avenue duplex. Two of her “beauties,” as she calls them, Matt King Coal and Championofthenile, are tied for the speediest Beyer Figures, a system for rating Thoroughbred performance. “Out of all the two-year-olds, that’s pretty incredible,” she says. Championofthenile has the same sire as Triple Crown-winner American Pharoah. A cozy room off the living room in her skybox-like apartment is bedecked with racing trophies and plaques; the shelves are full, so newer ones go upstairs. A relative newcomer to the sport, Rosenblum’s entry into the horse racing world was somewhat accidental. Born in Basel, Switzerland to a Roman Catholic Swiss mother and a German Jewish father, the family later moved to Miami, where her father, a physician, established his medical practice. At age 13, Rosenblum left home to study at the School of American Ballet, then went on to study at London’s Royal Ballet School before returning to the New York City Ballet’s school. She’d always dreamt of having something to do with horses—not necessarily racing—but as a ballerina, riding was not permitted. She later gave up ballet and went into modeling with the Wilhelmina and Ford agencies, which gave her more of the well-rounded lifestyle she’d been seeking. “Horseback riding and skiing were the two things that I always wanted to do; I thought they would be really exciting,” Rosenblum says. “I just happened to love animals and always wanted to ride a horse. It’s as simple as that. So I did! I started by taking riding and jumping lessons, and broke a shoulder immediately,” she says, laughing. Deciding jumping was not her forte, she got involved in dressage, and spent time in Wellington and Palm Beach, FL. She bought her first horse in 2010. “With regard to horses, it really just happened. I always loved horses, admired them from afar, always watched them more than the actors who rode them in movies,” she laughs. “I thought, you know what, now is my opportunity to do what I’ve wanted to do for years. She named two of her horses, Kara’s Match Point and Erik the Red, after her two children, daughter Kara, a freshman at Penn, and Erik, her 16-year-old son, who, she says, is the family artist-in-residence and an entrepreneur-in-training. “Owning one horse turned into owning two horses, then seven.” After stumbling her way into the racing world, Rosenblum says her luck really changed when she partnered with Rice. “She was my third trainer. And my kids said, ‘Mom, didn’t you say you’d get out if it didn’t work out with trainer number two?’ And I said, ‘Yes, I did. But I can change my mind, and I’ve decided I’m not getting out.’” And now, two years later, she’s got a stable of over twenty, in burnished brown leather harnesses with customized brass nameplates, at Rice’s headquarters at Belmont. The sport is subject to a great many obstacles and variables, and she attributes her recent winning streak to perseverance and plain luck. “I have no blueblood background in the horse world, no family in the horse world. I’m the only one,” she says. “My kids think I’m a rock star because of it. I’ve always been an advocate for doing the right thing, and I’m an advocate for New York horses, too,” she adds. 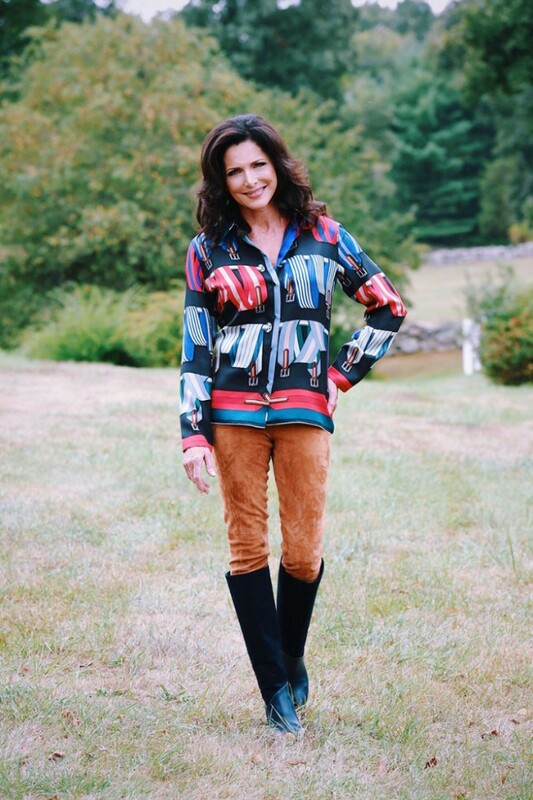 “I love New York and I love my horses predominantly in New York.” She is also an advocate for children’s rights, and sits on the board for the March of Dimes. Sheila Rosenblum’s Lady Sheila Stable Two is an all-female racehorse syndicate consisting of eight women, including trainer Linda Rice. 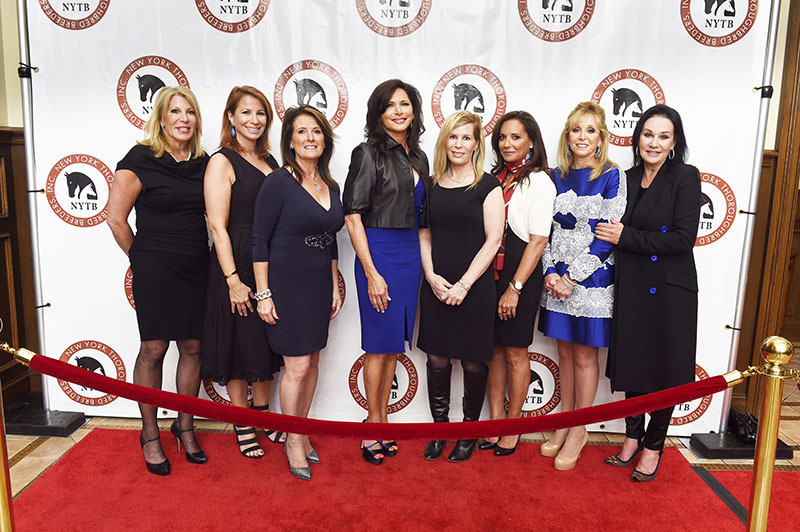 The other partners are philanthropist Iris Smith, Douglas Elliman CEO Dottie Herman, Diane Davis, Jessie Laiken, equine artist Donna Bernstein and former Real Housewives star Jill Zarin. The minimum investment to become a member of Lady Sheila Stable Two was $100,000. Currently there are four horses in the partnership; three-year-old Hillaryinthehouse, and two-year-olds Matt King Coal, Hotinthehamptons, and Talkin Til Midnight. Founded in April 2014, the syndicate sent out its first runner a year ago, in September 2014, and the syndicate’s earnings to date are $122,482. Matt King Coal is currently the superstar of the group, running a 93 Beyer speed figure in his last race, putting him in the top five two-year-olds this year. “We are hoping for some exciting races with him in the future,” says trainer Linda Rice. Talkin Til Midnight is the only horse in the group who has yet to make her debut race. “I strongly believe that increasing interest in the sport among women is crucial to the long-term vitality of the industry,” founder Sheila Rosenblum said. According to NBC Sports, 52 percent of the 16.2 million viewers of the 2013 Kentucky Derby were women, making it the only major annual sporting event that draws stronger viewership numbers among females than males.